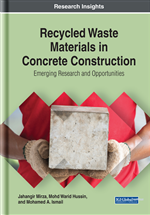 Chapter 3 is based on performance of mortar grouts incorporating rice husk ash (RHA) and fly ash (FA). Detailed experimental work was conducted to investigate the mechanical properties of mortar grout using RHA and FA as partial replacement of cement. This study investigated the compressive strength and durability of mortar grouts in their hardened state. Durability tests such as water absorption, apparent volume of permeable voids, sorptivity, and rapid chloride penetration tests are researched. Detailed results and discussion which focused on mechanical properties as well as durability of hardened state mortar grout are presented. It was confirmed that the inclusion of blended RHA and FA significantly improved the compressive strength of mortar grouts. The durability of mortar grout increased along with a longer curing time. Hence, RHA and FA can partially replace cement in the production of mortar grouts. Deterioration of concrete structures has shortened the service life of existing reinforced concrete structures (Horrigmoe, 2000). The major causes of concrete deterioration are a lack of consideration in design details, specifications, poor labour skills, etc. This leads to decrease in durability properties such as carbonation and chloride-induced corrosion of reinforcing steel that affects the long-term performance of concrete structures. The consequences of a concrete structural failure are severe and can be life-threatening. Spalling or cracking of concrete cover is the most common type of deterioration and the simplest way to rectify this condition is to use mortar grouting by patching the affected area. This will result in an extended service life of the existing reinforced concrete structure (Imbin et al., 2013). Mortar grout consists of a mixture of cement and other fine material such as fine sand. With the rising awareness of sustainability and environmental impact of construction materials, agricultural waste residues such as rice husk ash (RHA), palm oil fuel ash (POFA) and bagasse ash, in addition to, industrial wastes such as fly ash (FA), silica fume and ground-granulated blast furnace slag is increasingly used as supplementary cementitious materials (Nagaratnam et al., 2016; Sanal, 2017; Sanal 2018). This is to achieve high performance, good quality and low-cost concrete mixtures (Uduweriya and De Silva, 2010). Rice husk ash (RHA) is a by-product from the burning of rice husk. The milling of rice generates on average at 20% rate by weight of the 500 million tons of paddy produced in the world (Ganesan et al., 2008). Subsequently, the burning of these husks produces ash at an average of 18% by weight of the husks (Reddy and Alvarez, 2006). The pozzolanic activity of RHA depends on certain criteria such as the silica content of the ash, the silica crystallization phase, the size and the surface area of its particles and a low carbon content (Zain et al., 2011; Rahman et al., 2014). A case study was reported that addressed the technical considerations in Japan (Tateda et al., 2016) for the optimisation of rice husk burning in a boiler to retain a high solubility of silica in RHA. This study described step by step details to achieve the optimal operation of a boiler for stakeholders using RHA. The best quality of silica, based on a solubility evaluation, in rice husk ash and heat could be obtained simultaneously through the optimal operation. Since the boiler used in that study was very simple and inexpensive, the best practices reported at this study can be transferred and applied to using rice husks as a resource in many parts of world, especially in Southeast Asian countries]. Fly ash, on the other hand, is the non-combustible mineral waste from the coal industry. It is collected from the power generating plant’s exhaust, after the carbon is consumed in the power plant boiler and solidify as microscopic or glassy spheres (Papadakis and Tsimas, 2002). Similarly, it is also pozzolanic in nature and further aids flow-ability of cement-based materials (Nagaratnam et al., 2016). The application of RHA and FA in blended mortar grout is relatively unexplored. A significant amount of these waste materials is generated every year in many developing countries. Such wastes contain around 90% SiO2 and due to this high percentage of SiO2, it works as a pozzolanic material. Therefore, it is very important to utilize it in any cement-based materials like mortar grout and to further examine its hardened state properties.